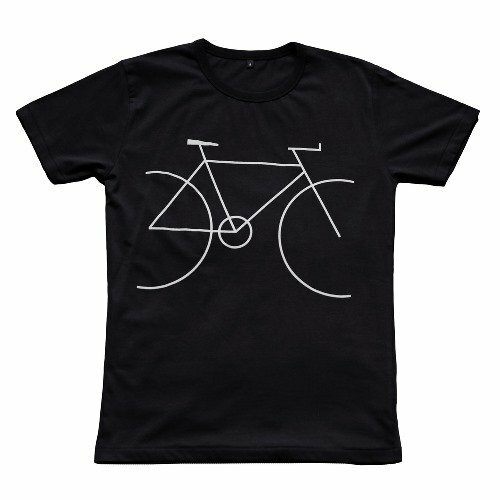 Image of Black Bicycling T-Shirt from Route Clothing. I recently came across a new fashion label, Route Clothing (www.routeclothing.com). It’s not one that I’d heard of before but what caught my eye, was that they had combined fashion with cycling, not something you see everyday! Impressed by the designs, prices and their slick website, I ordered two t-shirts. Route Clothing are babies, formed just last year in Glasgow. According to their website, founder David McNeil created Route as a way of combining two of his passions, fashion and cycling. His intention being that the wearer will look good both on and off the bike. Route are so new that they currently only have six items, based on three print designs and three colours, well four if you know the difference between Eggplant and Indigo (both look purple to me!). The three designs are called Wheel, Bicycling and Crash .. not sure on the name of the last one. The image above is Bicycling and as you can see, it’s a white design on a black t-shirt. It’s also available on an Indigo t-shirt. Priced at £26 it’s good value in my book compared to other high street brands. It’s made from Combed Cotton, whatever that is! To the touch it’s quite heavy which gives the impression that it’s well-made and durable. The second t-shirt is the Wheel design, pictured below, in Eggplant – apparently it’s a colour, who knew! This one is slightly more expensive at £30 but is worth every penny. It’s made from 70% Bamboo and 30% Organic Cotton (150gsm) and is the softest thing you’ll ever touch. I absolutely love it. Route brag about sustainable methods and for that you’ve got to give them credit. T-shirts may be limited in range but with products made from Turkish, Indian & Egyptian cottons plus ethically produced bamboo, these t-shirts are definitely something a bit different to most other cycling clothing brands. Make no mistake, these are fashion products and wouldn’t last two minutes if used for cycling. This video is copied from the Route Clothing website (hope you don’t mind Guys!) and is worth watching if you want to know a little more about the Environmental Justice Foundation. The video highlights their cotton campaign.